The amounts needed for the following ingredients depends on how many people you are planning to serve. If this is the main course, I suggest having enough for each person to make up to 5 hand rolls. Japanese seasoned rice vinegar (or heat unseasoned rice vinegar with granulated white sugar and coarse sea salt to taste in a pot over medium heat until dissolved) Note: You could add more sugar to the seasoned rice vinegar to taste if desired. Cook a pot of rice as per the package’s instructions. Once it is cooked, transfer it to a large and raised edge, heatproof plate. Gradually pour over the seasoned rice vinegar to taste, while gently mixing (not stirring) the rice with a spatula to incorporate. Try to use the spatula to lift the rice up and then flip it over; the intent is to separate the grains of rice and incorporate the rice vinegar gently. Allow the rice to cool to body temperature before serving. Meanwhile, prepare all of the other ingredients. (Optional: Toast the seaweed sheets by passing them, front and back, briefly over a dry, heated frying pan over the stove. Allow them to cool completely prior to serving.) Separate the crab meat sticks/pieces and transfer them from the package to a serving dish. Personally, I like to rinse them off and drain them prior to use to remove some of the added sodium. Cut the English cucumber into 2 to 3 inch long, thin strips and plate them on a serving dish. Put soy sauce into small dipping bowls and provide wasabi for your guests. Finally, use a large, sharp knife to cut the avocado into thin wedges. Cut and plate the avocados last to prevent browning. 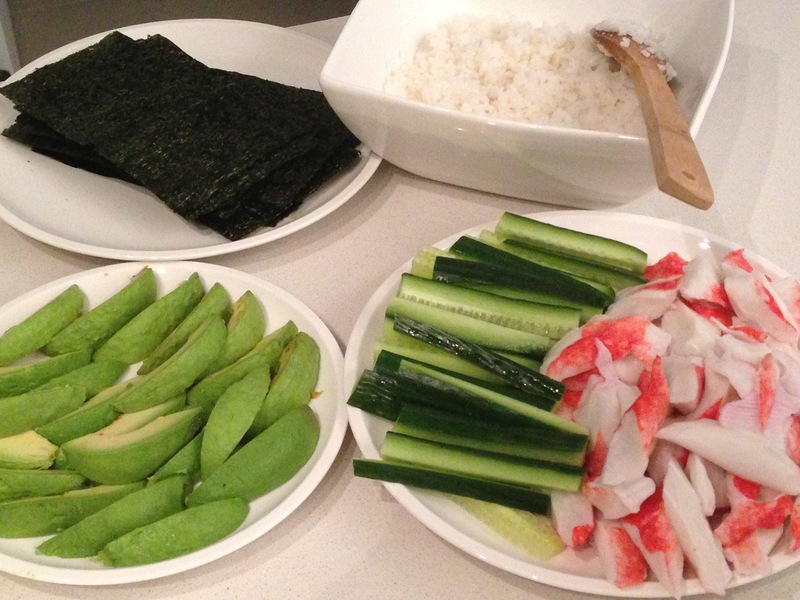 Place the seaweed sheets, rice, crab meat, cucumber slices, and avocado wedges in the centre of the dinner table and allow your guests to assemble their own hand rolls to their liking. To keep your hand rolls from unraveling, use a small dab of rice like glue under the edge of the seaweed sheet. Also provide soy sauce (or reduced sodium soy sauce), wasabi, and dipping bowls for each guest.